Entrance to ground floor to 20ft lounge, master bedroom, kitchen/dining room, shower-room with separate WC room. Stairs to first floor landing & bedroom 2.tree-shaded garden with panoramic views. Lounge: stone hearth, 3-piece suite seating for 5 persons, TV- UK free sat, DVD, Hifi and Wi-Fi. Kitchen: dining area with table and 5 chairs provides all the modern conveniences including fridge, freezer, gas hob and oven, washing machine, microwave, toaster and kettle, iron and ironing board. Bedroom 1: large room with king-size bed and storage. Bedroom 2: large room with 3 single beds and storage. Bathroom: Separate access to: A shower room with hand basin; a WC room. A beautiful & tranquil hilltop location with panoramic views, your gite and the HEATED POOL are situated on 5 acres of gardens overlooking woodland, valleys and fields: a tranquil, rural setting for your holiday. * Quiet holidays in a beautiful countryside setting beside the heated pool. * Cycling or walking on the huge network of waymarked tracks and quiet country lanes that surround us. *Great restaurants and, though we are biased, the most beautiful villages in the northern Dordogne. If you, or your children, are horse mad then there is à trekking centre nearly at Bourdeilles. For 2017 we are offering cycling support, both for those who wish to bring their bikes or we arrange all the equipment for you - tested routes with maps and guides are provided. We are avid cyclists and these routes will enable you to make the most of your stay here and see the very best the area has to offer. We have been letting now for 14 years giving us a great understanding of how to help you make the most of your stay in the area from the moment you arrive. Our location is the thing everyone comments upon - traditional stone cottage, perfect for your self catering needs with enclosed garden - lovely and cool in the summer. Being on the top of a hill the views are fantastic and there is no intrusion from road traffic by day, nor light pollution by night. However much we describe it, once here, our guests are always amazed at the tranquility and the clarity of the night sky. Villages with all amenities are just 5 minutes by car whilst the River Dronne is just 3km away (less on foot or cycle) for canoeing and river beaches. CYCLING: We are very keen cyclists and this area is excellent for on and off road holidays with a huge network of traffic free lanes and cycle/bridleways; the latter mapped and signposted. Introduced in 2016, we can organise your cycling at any level you wish: full self-guided touring with bikes, gear and routes provided, or bring your own and bikes and take up our self-guided routes. These are tried and tested circuits by us to ensure you see the best of the area. Includes maps and guide to get you round problem-free. WALKING: There are 200km of waymarked walks in our canton alone! Many times that within a short drive from us. We provide you with all the maps to enjoy these; everything from a 5km stroll (there is a choice of three right from your doorstep), to a whole day circular routes. The gite is a modernized cottage, equipped with the essentials you expect and need to enjoy your holiday cottage, including Wi-Fi and UK Freesat TV. We hope you choose to holiday with us in 2017. Gail and Mike have been at Meytreillac letting our gites for 13 seasons. We moved here from the UK in 2004 for the quality of life and the ability to pursue our passion for the outdoors; in particular cycling and riding horses. We have a lovely equestrian set-up here to ride and train our two stunning geldings and beautiful mare - 'Pamplemouse' (Mr P) is Gail's 17hh Selle Francais showjumper he is 11 yo and Gail's jumping horse and her dressage project,. 'Tommy' is Mike's 9 yo 16.3 Irish Draft who is devoted to Mike and is, shall we say, "a bit of a character". 'Tequilla' is a beautiful roane PRExcob. Whether schooling, hacking, rallies or competition, they are the focus of our lives here in France. Our other passion is cycling. With so many cycle opportunities, on and off road, this is a fantastic area to cycle, but we also take our holidays in other parts of France; taking our tandem to discover France by bike. We have travelled France for 20 years and chose to live in this area of the Dordogne because, quite simply, we consider it the best mix of everything that's good about France. The area has stunning beauty defined by valleys and hills, rivers and woodland. It's rural nature is tempered by the myriad villages that provide interest for us and vacation guests alike. Unlike the south of the department, it is never heaving with visitors yet it has just about everything to offer as the area is also built around its river, the River Dronne and beautiful riverside towns and hamlets. There is nowhere in France with all this and providing the very best in rural access for outdoor interests like walking, horse riding and cycling. It is, as we well know, imperious for horse riding and blessed with myriad small lanes and bridleways for cycling. It just does not get any better! Rural tranquility can often come with the disadvantages of isolation from towns. Our property benefits from the tranquility of no traffic and surrounded by just fields and farmhouses dotted as they are across the hills and valley. However, our own village is just 3km from us and we have 3 other villages within 5km providing everything you need for your self-catering holiday; including banks, supermarkets, pharmacies and an english GP! Our guests come back again and again; we may not be unique, but we know of no other holiday gites where you can have the true tranquility day and night that our rural position offers, along with the luxuries like heated pool, direct access to marked trails and all holiday activities within a short drive. shower, Hand basin. Heated towel rail. Shower is a large walk-in cubicle without door so making it easier for those with mobility restrictions. Le Chevalier has an enclosed garden, so nice and safe for those with toddlers. We arrange bicycle hire at discounted rates from an external company for individuals or families. these are delivered to your gite with all equipment. Perigueux has a popular municipal golf course and is less than 30 minutes drive. This gite is wheelchair accessible but NOT specifically designed for it. All facilities are on the ground floor with no steps and the outside grounds are level to parking area and to the pool. Internal doors are normal width. The heated pool is 10x5m with ample terrace and shade area. Notes on accommodation: Linen and all towels, including pool towels are included. Highchair and cot are available on request. Both gites are available at both 2 person and 4 person rates, so couples or couples with a small child can enjoy our lovely gites and location at rates normally found only in single bedroom cottages and apartments. Outside: A heated pool is essential in this area if the children are to be able to use the pool anytime, any weather. We have a fantastic 10 x 5m fully-heated pool from mid May to mid-September. With amazing views ensures the children can swim and play comfortably - no need to bring the wetsuits! Roman steps inside the pool and shallow area for the children. Plenty of terracing complete with sun loungers. Built into the south facing hillside, the views from the terrace and the pool when you swim are amazing. Pool from mid May to mid September. Each gite has its own separate garden, furnished for dining outside and BBQ. We have 5 acres of gardens and fields with shady trees to lounge under and spots to take in the views and picnic. There are also our stables and a sand school where you can watch the horses being ridden & trained. We have our animals so the children can watch and feed our pet pot-bellied pigs as well as the chickens. Despite being in the heart of the Dordogne and close to towns of Brantome, Bourdeilles & Lisle this property is wonderfully isolated without a road or car in sight. 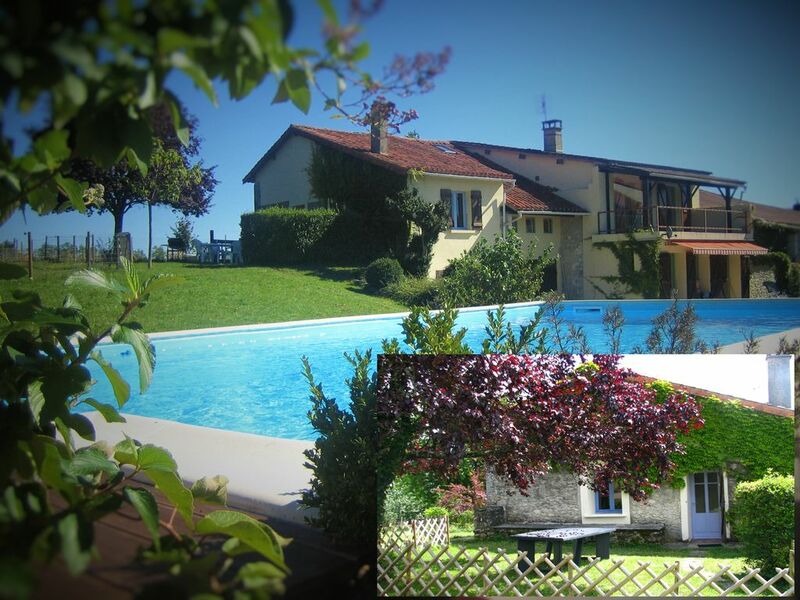 The property is a simple farm gite with a superb swimming pool and views to die for!! Empty lanes, great for cycling. Canoeing nearby & don't forget to visit the pop up pizzeria in nearby Creysac and the great deli/bar/ restaurant/bakers in Grand Brassac. Gail & Mike are lovely hosts, don't hesitate to speak to them about anything, they're really helpful. We had a great week with amazing weather ....even though we had elderly parents in tow 😬!! Calm, relaxing location with beautiful views and attentive owners. We love staying with Mike and Gail, nothing is too much bother for them. It's the most relaxing, rejuvenating holiday we've ever had. There are beautiful local villages and larger towns within a short distance. A pack is provided at the gite with recommendations of places to visit and eat. The pool, views and local walks make it somewhere you can spend the day or look forward to returning to when you've been out. My husband likes to cycle and the girls love horses and photography so there's something to keep all the family happy. I have to confess to shedding a tear each time we leave. It was lovely seeing you all again Clare. The girls have grown up so and blossomed into lovely young ladies. The photos of the horses you sent were truly beautiful. Thank you. Look forward to your next visit. Brilliant holiday again; this is our third holiday, this time in Chevalier. Lovely gite and still as peaceful here as ever. Lovely Gite in beautiful surroundings with great hosts. We arrived at the Gite mid afternoon and were greated by Gail and Mike. After going through the do's and don'ts of the pool etc, the kids jumped straight into the pool and really didn't come out until a week later!! There is not much to do at the Gite other than relax, my kind of heaven. However it is fantastically placed for visiting other towns such as Brantome, Perigeuix and there are plenty of markets and restaurants to visit too. Mike and Gail are wonderful and they really will do whatever they can to help you enjoy your stay. We cannot wait to return and see them again. We would thoroughly recommend this place to stay with children (or without). A lovely week in Le Chevalier. We got the peace and quiet we craved on the first week of our France trip. We were looking for rustic and rural and got what we were after. All needs were catered for in the gite with lovely thick walls providing a great respite on the couple of days when the temperature really soared. The kids loved the pool and were delighted to be taken to meet the owner’s pigs and horses. There’s great outside space for eating and playing and the location on the side of a beautiful valley provided great view. My favourite spot had to be the swing chair under the loaded apple tree. Whilst not on the doorstep of one of the bigger towns in the area, the location proved spot on for exploring the Dronne valley with plenty to do within 30 minutes’ drive and Brantome being our favourite trip out for the scenery, the market and a great kayak trip. The owners, Gail and Mike, were very friendly and struck a great balance between being helpful and available but discrete and keen to let you enjoy the holiday in your own way. A great stay and we will definitely return when we are next in the area. We had a wonderful ,relaxing holiday at this lovely gite. Everything we needed was there, the kitchen was well equipped to a very high standard. It was very clean and comfortable. There was tv and a cd player . We ate all of our meals outside to make the most of the beautiful weather and stunning views. Gail and Mike were extremely helpful and informative. Our favourite restaurant was Le Cabanon at Creyssac where they serve excellent pizzas and salads with a smile. Remember to bring cash as they don't take cards. It is in a beautiful location by the river. We also liked Le Moulin at L'Isle which was traditionally French. We hired bikes from Dordogne Cycle hire which were delivered to our gite and collected , we cycled along Voies Vertes which is a disused railway track with plenty of places to stop for a picnic. We also visited Chateau Nord and the lovely town of Brantomme. All in all a brilliant holiday we will definitely be back for another visit as we have so much more to see and do. Cycling and Walking holidays can be arranged as part of your gite rental. Everything from simply us advising you on routes to full packages with cycles, maps, detailed itineraries and pre-booked tours. Our knowledge of the horse riding centres and activities means we are glad to help organise horse-riding trips suitable for your ability, for both adults and children. We are under 2 hours drive from the coastal beaches of Bordeaux and the lakes at Lacanau. Arcachon can be reached in 2.5 hrs and is a frequent day trip for visitors here who want a day at the beaches. There are two lakes nearby with sand beaches, lifeguards, water-based activities and commerce/restaurants. There are also two river beaches on the River Dronne with amenities, one with lifeguards and both less than 10minutes from our gites. Airports: Bergerac 55 mins: Limoges 1hr 20mins: Bordeaux 1hr 40 mins. Caen/St Malo is 5-6hrs drive: Calais is 8hrs. Grand Brassac is our nearest village, 3kms and has boulangerie and cafe. Tocane and Lisle offer full amenities/facilities, each is 6km. The beautiful towns of Brantome and Bourdeilles on the River Dronne are less than 15 minutes drive from us, as is the market town of Riberac further downstream. The vineyards of Bergerac can be reached in 45 minutes by car whilst St Emillion and the Bordeaux vineyards are less than 90 minutes. This area of the Dordogne is famous for its local delicacies and we are spoilt for choice for quality restaurant food from "plat du jour" to Michelin stars. We are at the centre of the network of marked trails for walkers, cyclists and horse riding with hundreds of kilometres of marked trails on circular routes through woodland,hillsides and along the rivers. The River Dronne provides many canoeing stretches and is the prettiest and quietest of the Dordogne's rivers for this activity. In high season, its possible to canoe and stop at restaurants en-route for a riverside meal.